Reality, how do we get there? We know how certain features of our macroscopic everyday world unfold and we capture these in mathematical formulas, but often these explanations do not have a basis in the microscopic world of colliding and randomly moving molecules. Frank Redig wants to understand the relation between microscopic and macroscopic reality, in particular for non-equilibrium systems. He was awarded an NWO TOP1-grant for his research into the conditions that must be met by a model of a non-equilibrium system, for it to be mathematically solvable using a powerful technique called ‘duality’. Non-equilibrium means that the reversal of time results in a different movie being shown. For such systems, we try to mathematically explain how macroscopic laws emerge from the underlying microscopic world. Prof. dr. F.H.J. 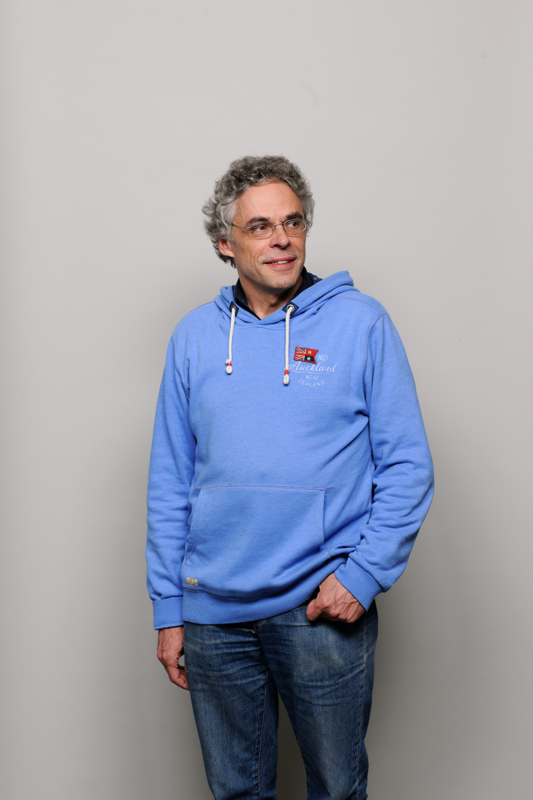 Redig completed his MSc and, in 1992, his PhD at the University of Antwerp. He subsequently spent six years as a monk and two years as a postdoc. From 2000 till 2005 he was assistant professor at the Eindhoven University of Technology, followed by four years of associate professorship at Leiden University and an appointment at the Radboud University Nijmegen. As of 2011 he is full professor in Applied Probability at the Department of Applied Mathematics of the faculty of Electrical Engineering, Mathematics and Computer Science of the Delft University of Technology. magnets. These are, however, examples of systems in equilibrium. Models of non-equilibrium systems are often not mathematically solvable, and there is no general theory linking the micro-world to the macro-world, such as the Boltzmann-Gibbs distribution for systems in equilibrium. “The physics of non-equilibrium phenomena is predominantly undiscovered territory,” says Frank Redig. “We know what happens at equilibrium, and close to equilibrium, but not far away from it.” He explains that a metal rod, of which both ends have a consistent but different temperature, is a good example of a non-equilibrium system. “We know the formula that describes heat conduction from the hot end of this rod to the cold end. This formula can be easily deduced from the law of the conservation of energy and the fact that heat flow is proportional to the temperature gradient. But this is a phenomenological description. What is lacking is a mathematical proof based on a model of the underlying microscopic world of individual vibrating atoms. I want to understand the emergence of the macro law from the microworld. How does the time evolution of the degrees of freedom of these individual atoms result in the heat flow? To develop such a proof, my colleagues and I apply statistical models that are simplifications of the microscopic quantum world. The Boltzmann-Gibbs distribution is a probability distribution of the microstates of a system in thermal equilibrium. The higher the energy of a microstate, the lower the probability of this state to be occupied or present. The probability of a high-energy microstate increases with increasing overall temperature of the system. The Boltzmann-Gibbs distribution provides the exact compromise between maximum entropy (amount of chaos in a system) and minimal energy. A model is a mathematical representation of a physical system. For example, particles jumping independently, and at random intervals, on a two-dimensional lattice. Or a chain of particles connected by springs to their nearest neighbours. The mathematical formalism used by the researchers, is at a higher level of abstraction than duality itself, and depends on the presence of additional symmetries in the models. To study these symmetries, the researchers use the so-called Lie-algebraic approach. According to Redig “this approach does not only indicate if duality is possible, it even automatically provides all duality functions. Depending on what you are interested in – the physical current, the number of particles, etc. – you only have to pick the appropriate duality function.” In a collaboration with Frank den Hollander from Leiden University and Cristian Giordinà from the University of Modena and Reggio Emilia (Italy), Redig received a TOP1-grant from NWO to further develop and apply this methodology. Under certain conditions, a model that is not mathematically solvable may be ‘linked’ to a simpler model that typically has no physical meaning but that is solvable. The link between these two models is the so-called duality function. Non-equilibrium means that the movie of a physical system looks different if you reverse time. A flow is present. In an infinitely large hourglass (sand timer), the same number of grains of sand will pass the narrow opening each second. If you reverse time, the grains will no longer fall downward but upward. An important aspect of their research programme is the application of their theory to inhomogeneous systems, such as impurities in the metal rod mentioned earlier. “Nearly everything in the world is inhomogeneous,” Redig explains. “It only appears to be homogeneous when observed at a certain scale. Just like Redig’s interests, the application of duality is not limited to fundamental physical processes. “Think of the distribution of wealth in our society. The same mathematical models are applicable, because ‘something’ (money) is distributed while the total amount is conserved (if you look at the correct time scale). The fact that someone in the USA may handle money differently from someone in the Netherlands, can be modelled as a form of inhomogeneity. Through the ages, the distribution of wealth has satisfied the Pareto-distribution, 80% of wealth for the 20% most wealthy people. I want to know if a microscopic theoretical explanation exists, just as it does for the distribution of particle speeds in idealized gasses. Duality can also be applied to biological systems – the conserved quantity being the population size. Think of how population characteristics develop over time through evolutionary forces such as mutations, selection and migration. Though speculative, even human consciousness may be a consequence of a micro-to-macro transition, related to the physics phenomenon of a phase transition. “A single water molecule does not freeze, but a large number of such molecules can undergo a phase change from liquid (water) to solid (ice). This phase transition can be mathematically explained by applying the thermodynamic limit – an unlimited number of particles in an unlimited volume. The same may be true for various phenomena in the brain. We hope to discover equations describing a macroscopic system of neurons.” This would mean that Redig, who thinks of both his mathematical work and his hobby of playing the piano as ‘dreamlike improvisation’, would possibly reduce his own creative processes to an equation. Nodes is a publication of the faculty of Electrical Engineering, Mathematics and Computer Science at Delft University of Technology. It’s a science blog filled with stories about the research, expertise and vision of our scientists.